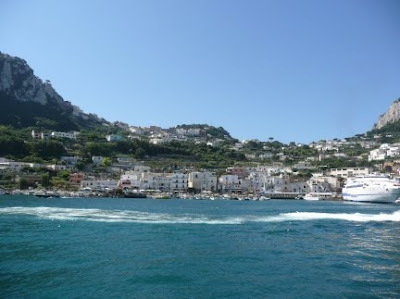 We took a bus to the port at Sorrento and caught the hydrofoil to Capri - a smooth crossing, and it took about 25 minutes. 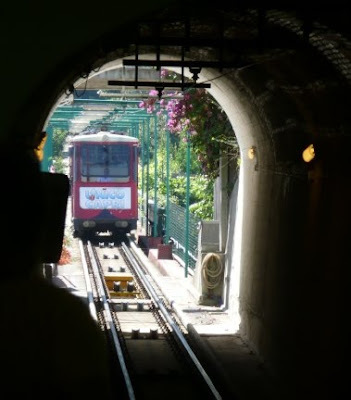 Once we'd disembarked, we bought tickets for the funicular railway to take us up to the maim square in the town. 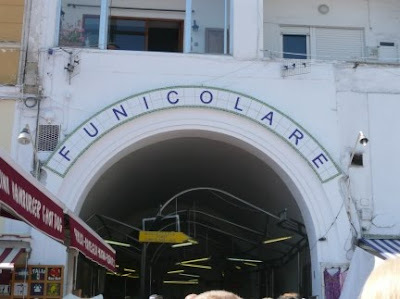 The funicular is a kind of cable car but it runs along the ground (there used to be one at Vesuvius - hence the song 'Funiculi, funicula'). It takes 75 passengers at a time (counted through the gates as you stamp your ticket in the machine) and runs every 15 minutes. 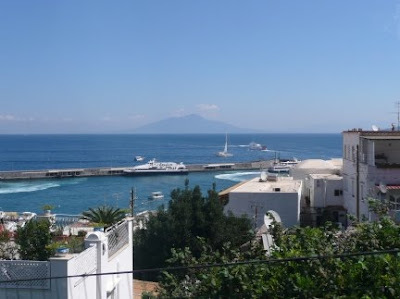 Capri town is very pretty; we stopped for an ice cream and a wander round. 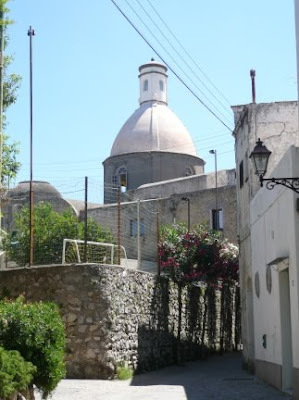 Then we caught the bus to Anacapri. It wairly scary if you were on the seaward side - very narrow roads, hairpin bends and sheer drops! 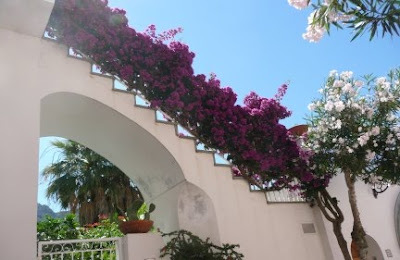 Had a wander round Anacapri, very pretty, with lots of bougainvillea. 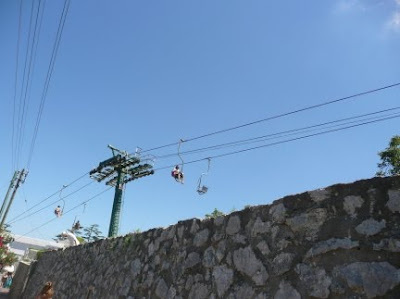 Then we headed for the chairlift. 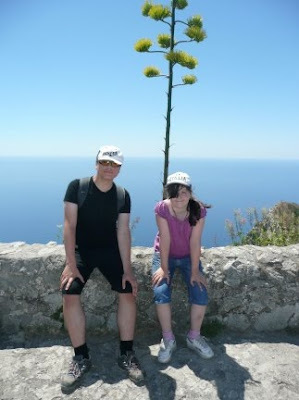 We'd been recommended to use this to visit Monte Solaro, the highest point of the island (559m above sea level). You travel 1211 metres, up an incline of 288 metres, at a rate of 1.5m per second (i.e. it's about 15 minutes each way). 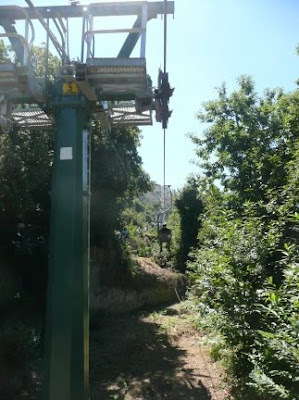 Was pretty scary going up (hence the poor quality of this picture - I had one arm wrapped round the pole!). But the panoramic views at the top were worth it. Going down on the chairlift wasn't quite as scary as going up (though this pic shows the incline better than the 'up' pictures do). 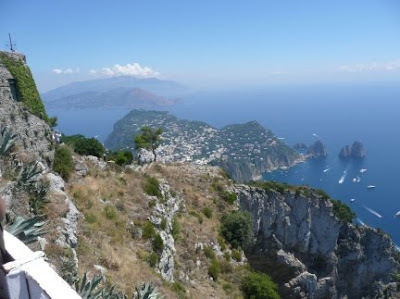 We stopped for lunch at a caffè (and, as we were in Capri, I ordered pizza Caprese, i.e. 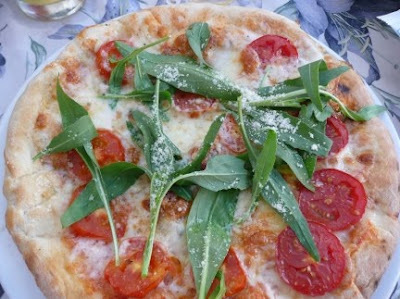 with mozzarella, sliced tomatoes rather than sauce, and rocket). 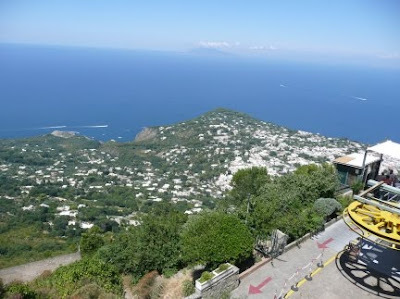 Coming back to Capri was a little tricky - the bus we'd expected to catch to the port was full, and for some reason the next three 'every 5 minutes' buses to Capri town didn't turn up... 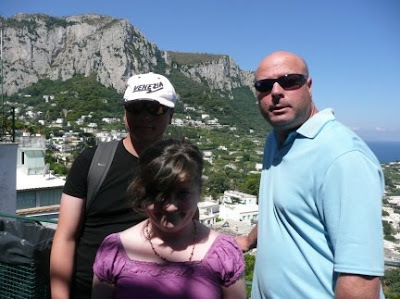 But we were very lucky with the timing of the funicular, and made it in time for our return trip on the hydrofoil. Then it was the gala night dinner - melon, mozzarella, tomato and bruschetta, followed by turkey, and then 'Vesuvius cake', which the children really enjoyed - a kind of baked alaska but with layers of ice cream. Very evocative...have you ever thought of writing guide-books as a side-line?! Fab, Kate. I has much envy. Jan - it's lovely. And is my setting for the next book, when I've finished my revisions. 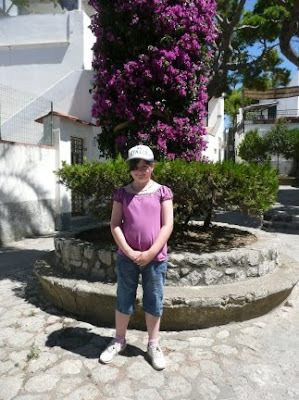 I loved Capri. Could have stayed there forever. 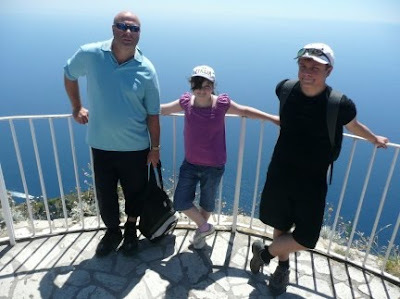 Capri... oh mio Dio. Lovely and breathtaking. Special to my heart... I often visit it during the year. 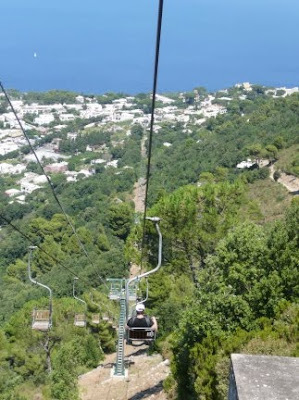 oh, that chairlift looks scary and no way could I have looked at those views. I would have needed alcohol instead of pizza when I hit ground again.